Karuizawa is a town in the mountains in Nagano prefecture, I think, and is full of bracing things like fresh air, rain, trees and people, so it’s is good to go to if you live in the chemical smog of Tokyo, or, indeed, Kawaguchi. The other good thing about the place is that you get to go on a shinkansen (bullet train) to get there, which, if you are 35 years old is pretty cool (though, following the immutable law of the universe of you wait ages for one trip on a shinkansen and then two turn up together, the week before I went down to Osaka on business) but if you’re 2 and-a-half (and really, really into trains) it is just the best thing ever in the world. 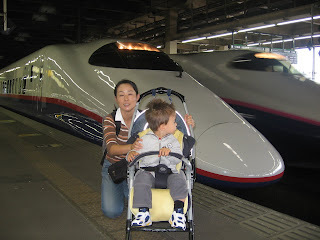 Even better than all that, if you are parent of said 2 and-a-half year old, the journey by shinkansen is only about 1 hour, meaning that once the magic of the ride has worn off, child doesn’t have too much time to get bored before you arrive – great! Anyway if you look here you can see pictures of small boys and big trains. Later we dumped our stuff at our pension, a slightly sinister, slightly creepy place, in a you’re-the-only-people-staying-and-no one-knows-you’re-here kind of way. 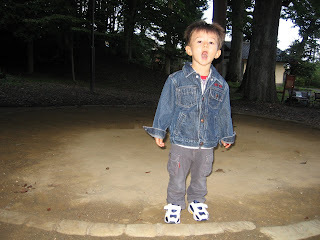 Then we wandered off to find a park to run around in. 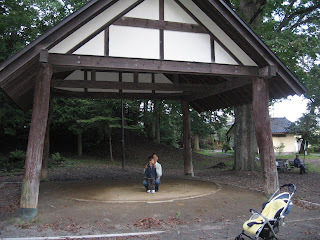 This we did, luckily, and found not only a park but also a small shrine, which was ok, and also a small sumo dohyo, which was really cool. 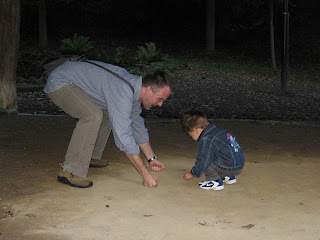 As you can see from these pictures I taught the youngster the finer arts of the samurai scream and the tachiai – gave me a warm, fatherly feeling I can tell you. Back at the creepy pension we then attended to our nightly routine, i.e. bath, beer and dinner. The bath was fine, though unfortunately not the onsen style that one might have hoped for. Beer was provided by a small fridge on the 1st floor landing, you helped yourself and made a note for the owner to tot up upon check out. The problem was that they were charging 300 yen for a small can and, as there was no local beer machine and the rooms had no fridges, this was the only way to get a cold one. Unless you are cunning, of course. So before bath I had one of their overpriced beers but super cunningly I had, beforehand, been to a local alcoholic emporium and brought similar though cheaper cans of asahi superdry. Once I had taken one of their overpriced cans I replaced it with one I had brought, thereby keeping it cool. Later, after dinner (more of which in a moment), I was able to drink a couple more cans of cold beer, but it was the ones I had brought earlier for less cash. Anyway the upshot was that I got to drink beer but didn’t have to pay through the nose for it. I thought it was cunning, the Guru just thought I was being dishonest and tutted at me reprovingly as I quaffed. Dinner, however, was a fine proposition. 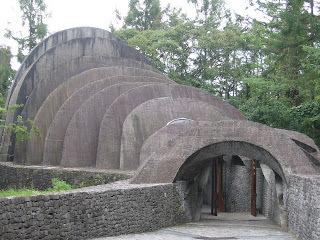 How many small pensions in Naka-Karuizawa can boast a Japanese chef who thinks he’s French? Only one to my mind, and that’s where we pitched up. The meal he knocked up for us was really good, a 5 course extravaganza that included soup, fish and meat courses, all of which were tasty and of sufficient volume to fill my stomach. The problem, however, was that the food all arrived in something of a rush. The starter was fine as that was waiting on the table for us, then the arrival of the soup was ok as well. But then, as the last drop of soup was slurped the fish course arrived. Again this was very pleasant, some sautéed sole, if memory serves, but as I was pontificating about something the Guru finished hers a few mouthfuls before I did and, as soon as her fork touched the plate for the final time, the meat course was brought out. So, as she started on her beef fillets I polished off the sole, put the used plate on my left and then started on the beef with nary a break between forkfuls. Now, of course, she was far ahead of me so completed her beef whilst I had only got though half, but no problem as then desert arrived, giving me the slightly cack-handed task of, on finishing my meat, transferring the desert to my place mat and placing the dirty dish on my right (where the desert had been), so that I then had dirty dishes all around me. Ah, the romance of fine dining. I mean, is it too much to ask for them to allow a breath between courses, of for both diners to finish one course before starting the next? Actually no, not in Japan, as, to be honest, it doesn’t seem to be something Japanese restaurants have got their heads around (generalising wildly as I go). This might be to do with traditional Japanese cooking, where you tend to get everything placed in front of you when you sit down and then just plough your way through (i.e. like a meal in a ryokan) so the serving staff don’t need to worry about courses; or other Japanese eating experiences like shabu-shabu, yakiniku, okonomiyaki etc where you do it all yourself. It also happens with main courses if you have more than 2 people sitting down to eat – often 2 will get their meal whilst the rest will have to wait a further 5 minutes before tucking in. I don’t know, but it does seem to be something of a cultural blind spot. The following day we what most people do when going away for a couple of days in Japan and went to an onsen. 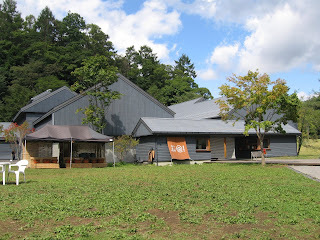 This was a jolly swish, new looking place to the north of Karuizawa, up a hill a bit. This is worthy of mention as it was the youngster’s first trip to an onsen and we were on the wary side due to the often very hot nature of the water (and he, being small, isn’t too good with hot water). But like most things when you’re 2½ years old he just took it all in as a big adventure. The good thing about onsens is that they are generally big, so lots of space to run around naked, which is what all little kids enjoy doing, as, let’s face it, do their fathers. So we did the whole onsen thing of washing and then sitting around outside in the bath generally relaxing and so forth. Nice though the onsen was it didn’t actually provide a beer machine for me to buy beer, so one of life’s little pleasures was unfortunately denied. But the bar next to the onsen did serve some local brew, the name of which I have now forgotten, but it was jolly nice. That day we also visited an odd shaped church, which was odd but strangely pleasant. The oddest thing about the place was its founder, however, who was big in dentistry in the early 20th century and this was how he made the money to build the church. Under the church, where the crypt should have been, they had a little museum dedicated to him and it had old slogans he had made up, like ‘Spirituality Through Healthy Teeth!’, which I thought was great. Anyway that was about it. I’ve written too much now, my work here is done.